An cop and a weird FBI agent join forces to stop a murdering space alien. This film could be compared to "I Come in Peace". 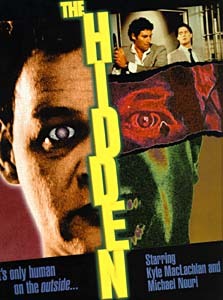 THE HIDDEN features action and FX. Michael Nouri (Love & War) and Kyle MacLachlan (Dune) give entertaining performances as the cop and FBI agent, respectively. The FX, by Special Effects Coordinator Gregory C. Landerer, are gory but great.